In a city with more dogs than children — and where admitting you’re not a dog person can get you dirty looks — can dog-wary individuals find peace? Jim Barker is reluctant to admit that he doesn’t actually like dogs. You see, the pressure to love them in Seattle, a city where canines are more prevalent than children, is so intense that he can barely concede it even to himself. 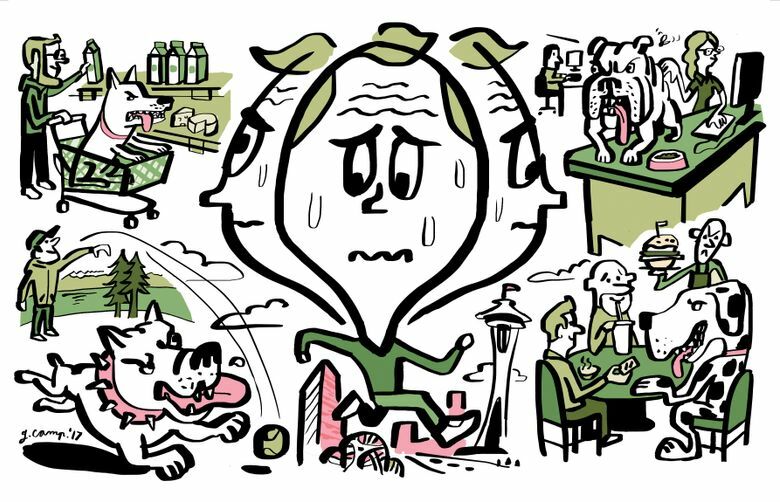 “I’m afraid I’ll be judged as soulless because I don’t want to get down on the ground and snuggle with them,” said Barker, a corporate trainer for Seattle Cancer Care Alliance. He’s tried over the years to befriend them; he’s petted them, smiled at them and even baby-sat a neighbor’s pooch, but to no avail. “If people ask, I deflect and tell them I’m more of a cat person,” he said. It’s a dilemma comedian Sam Miller understands. The Olympia-based comic who performs weekly in Seattle is legitimately afraid of dogs because he grew up being chased by a neighbor’s Rottweiler. Miller finds it preferable to hunch and contort his 6-foot-5-inch, 300-pound-plus frame into the smallest it can be, which he believes is “less threatening” to canines, than to just tell the truth. If it was just a matter of avoiding off-leash parks, that would be one thing, but here in the Emerald City nearly all new apartments allow pets, and non-service dogs can be found not only running free in nature reserves and on beaches, but also at work, in malls, on buses and trains, and even restaurants and grocery stores. So where can dog-wary individuals — or even those who like dogs but don’t enjoy seeing them run illegally off leash — find peace? Some find themselves spending their free time outside the city. Others avoid parks. Some stew in silence and vent their frustration about “self-absorbed dog owners” on internet forums. Still others have resigned themselves to being yelled at, or deemed soulless, when they speak up in public spaces. And still others, like Miller, have learned to endure the crotch-sniff greetings while practicing a form of mindful acceptance. And while this may all seem like a small, or even amusing, matter, it nevertheless touches on significant social issues concerning entitlement, rights, public safety and how best to acknowledge and handle opposing interests in a dense and ever-growing urban environment. “It’s a safety issue as well as a cultural phenomenon,” said Ana María Sierra, a clinical psychologist and therapeutic yoga educator, who believes pets should be as well-behaved and polite in public as children are expected to be. Richard Schwartz, a retired English teacher who lives in Seattle’s South Lake Union neighborhood, said it’s the owners, not the dogs, that cause him the most grief. “There’s a sense of entitlement among some dog owners that’s troubling,” he said. While he is not thrilled to see non-service dogs in restaurants and grocery stores because he’s “not sure dogs are particularly clean,” he doesn’t feel the need to comment. Schwartz says some owners pick and choose which laws apply to them and thereby demonstrate an “anarchist’s mentality” that’s only made worse by what he describes as the city’s reluctance to enforce existing leash laws. “If animal control would come down and ticket occasionally, word would get around,” Schwartz said. Dog owner Gerard Casavant said that he and his wife have taken pains to socialize their dog so that it doesn’t bother or pester people. Their dog, a pound puppy, is reserved and never goes sniffing where not invited, he said. “I do understand that when there’s a problem, 99.9 percent of the time, it’s the owner not the dog,” Casavant said. Although Miller, the comedian, has been afraid of dogs since his childhood in Spanaway, he wants it understood that while he fears dogs, he does not hate them and, in fact, does not even dislike them. Over the years he has known many “awesome dog people” and has tried to combat his fear. He has developed coping mechanisms that include crossing the street when he can and assuming the crouch position when he can’t. Despite his best efforts, however, he does sometimes end up getting scared, which can cause dogs to pull away or bark. Colleen Lynn, the founder and president of DogsBite.org, a nonprofit public education website, said the conversation is often erroneously cast as being for or against canines when it should be about entitlement. So what are the options for the dog-leery? “There are a lot of dogs and that is part of life in Seattle,” said Samara Serotkin, a mindfulness-based psychologist. From a Buddhist standpoint, she said, distress comes from an attachment to how things “should” be. Instead, Serotkin advised, take your focus off the dog. As you walk by one on the sidewalk, for example, count your steps, feel your breaths, notice your footsteps, see the sky, smell the air, look for interesting textures. With practice, the dog will take up less space in your head, she said. Joseph S. Weiss, a Seattle-based psychologist who specializes in treating anxiety, said yoga and breathing exercises are helpful whether dealing with a fear of dogs or just irritation with dog owners. He teaches patients how to use their own acupuncture points to calm themselves and how to use their minds, their own “virtual reality machines,” to practice confronting the source of fear or anxiety. “I would have them imagine what would be happening as a dog approaches and have them deal with the thoughts and feelings that are coming up, then freeze-frame the mental movie and go through it again. People are usually surprised how quickly it can work,” Weiss said. But Sierra — who wanted to be clear that she is herself a dog lover — thinks the onus for action should be on the dog owners and not the dog-wary. “Whose problem is this and why should the people who are being overrun have to be the ones who seek treatment?” she said in a telephone interview. She advised those who are circumspect around dogs to tell owners that they are uncomfortable.